Three standard models offer choice of insulated long or short handles on cutters for soft wire and insulated long handles on cutters for ACSR. Chance orange 1-1/2" dia. Epoxiglas® handles have black rubber cushion grips. 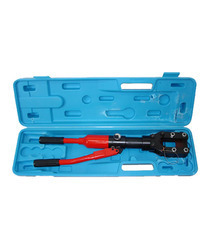 Imported hydraulic conductor cutters with a capacity to cut conductors up to 40mm diameter are available with us. 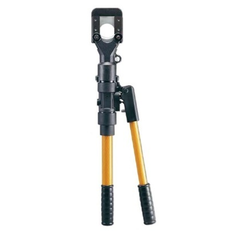 Amico Hydraulic cutter is the most versatile tool ever developed indigenous. The cutter is suitable for cutting various ferrous/non ferrous metal rods, ASCR conductors, E Wires etc.The cutter is very handy weighs only 5Kgs (approx), requires minimum maintenance & requires no setup time. Asia Machine & Instrument Co. Backed with support of experts, we are occupied in providing a flawless series of Hydraulic Conductor Cutter to valuable customers. Details For ACSR ( up to 40mm dia.) For earth wire ( up to 20mm dia.) For PVC insulated Aluminium Cables up to 90mm dia. Eurotech Electric & Engineering Co.
Amico Hydraulic cutter is the most versatile tool ever developed indigenously. The cutter is suitable for cutting various ferrous/non ferrous metal rods, ASCR conductors, E Wires etc.The cutter is very handy weighs only 5Kgs (approx), requires minimum maintenance & requires no setup time. Hand hydraulic cutter design for cutting copper, aluminium, ascr, aluminium steel cable, steel ropes and rods. Blades made of high strength steel, heat treated.